Usually I don't like reading the later books in a series without reading the first. 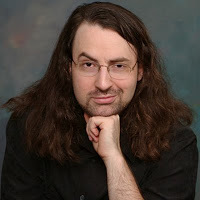 In the case of The Dresden Files series I made an exception. I had read one of the books before but had not read the first. I liked what I read so when I saw Changes on deep discount I picked it up without worrying about where it was in sequence. It's closer to the end, maybe firmly so, judging by some events. But like many such books in long running series if you are interested in the themes, you can buy this book and enjoy it without having read all of the other books-though that probably helps. Ok, what's it about? 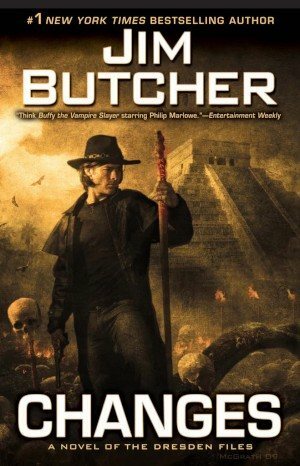 It's similar to the Mike Carey book I reviewed earlier though I think that Butcher was published first. It's a mystery book with supernatural elements. Or maybe it's a supernatural book with mystery elements. Basically not only is magic real but also everything you ever worried about that goes bump in the night, every crazy myth, every religion, is all real as well. Vampires, ghosts, goblins, elves, demons, angels, gods, everything. They're all out there. Smack dab in the middle of this is one Harry Dresden, who is a Chicago based practicing wizard and private detective. Dresden is more public than most of his magic using brethren prefer. Dresden is something of a maverick who is known to stretch if not outright break rules if he thinks he has a good reason. Wizards are not allowed to kill humans using magic and Dresden does his best to follow that rule. It's a pretty serious rule and breaking it can get a wizard killed himself. But Dresden also carries a few sidearms. Although Dresden is not the most powerful wizard, he may have the most natural talent and is part of the White Council, an organization tasked to protect normal humans from abuses of magic. In this book, Harry is literally minding his own business when out of the blue an ex-girlfriend named Susan calls him up to tell him that vampires have stolen their daughter. This is a double shock to Harry as not only had he not had any contact with Susan for ages but he didn't even know that he had a daughter. And oh by the way he doesn't know if he can even trust Susan as Susan herself is now a half-vampire which is part of the reason they had a rough break-up. 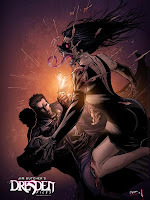 The vampire Arianna Ortega intends to sacrifice Harry's daughter in revenge for actions Harry took previously. And she's supported not only by all the Red Court Vampires but by the evil gods they serve. There are different types of vampires. Arguably Red Court is the most organized, the most dangerous and almost certainly the most vicious. Harry's tangled with them before and it's not something he looks forward to doing again by any means. Sanya, a Black Russian man who, despite being a committed agnostic, wields a holy sword built from the nails used in the crucifixion and given to him by an angel. So Sanya is a paladin. 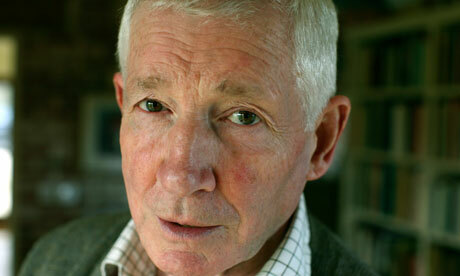 He is the last remaining Knight of the Cross. Despite this honor Sanya still insists the angel may be an alien or a hallucination. Donar Vaderrung aka Mr. Wednesday aka The Allfather aka Odin. He's not what he used to be but even a diminished god is exponentially more powerful than Harry. Karin Murphy a no nonsense Chicago Police Officer. She and Harry may or may not have a thang going on. Molly, Harry's girl Friday and young apprentice who, according to the other women in Harry's life, does have a thang for Harry. John Marcone-the head of the Chicago Outfit who intends to kill Harry someday, just not yet. Harry's feeling towards Marcone is mutual. Despite being completely evil, Marcone doesn't harm children and enjoys hurting those who do. Lea aka Leanansidhe, an elvish sorceress who is literally Harry's faerie godmother. Thing is, elves aren't nice and have little use for or understanding of human morals. They do however take oaths and promises (implied or explicit) very seriously so it's extremely dangerous to even speak with them though they certainly enjoy wordplay. Mouse-Harry's dog and bodyguard, a Tibetan Temple Mastiff who has powers, intelligence and abilities of which even Harry is unaware. Susan and her associate Martin, both half-vampires, who lead an underground terrorist organization that kills Red Court vampires. Thomas Raith, Harry's half-brother and a White Court vampire. Vampires of the White Court are basically incubi/succubi and feed off human emotions-primarily lust. The book is told in first person which is pretty par for the course for this sort of noir fiction. Harry is a bit of a smarta$$ to everyone he meets, especially if they have more power than he has. He explains this by saying that to many of the predators he must deal with in his line of work, like Marcone, everyone else looks like prey. It's best for his business relationships and his continuing existence on the planet that dangerous people think that he doesn't care how dangerous they are. This book was a little long at just over 400 pages hardcover. There's quite a bit of ironic humor within. Although I liked it I probably would have been a bit more emotionally invested in it had I read about Harry's abortive relationship with Susan earlier. There is a lot of explanation of the limits and rules of magic. But the story feels very real and logical. You shouldn't be put off by the magic elements. It's really just a good old fashioned detective/adventure/mystery story overlaid with a roaring rampage of revenge theme. Harry gets tired, makes mistakes and gets seriously hurt. He also has to decide if he's willing to break laws of morality and magic in order to rescue his child. It's a rollicking good time and with the exception of one or two missteps I enjoyed the story. This book is just what it sounds like. It lists ten of the most public or infamous murders of various mob/Mafia figures in the 20th century. The introduction is by now deceased former mob associate Henry Hill (inspiration for the movie Goodfellas) who gives a quick overview of exactly the sort of mafia protocol violations that can see an up and coming mobster appear in a car trunk or end up at the bottom of Sheepshead Bay tied to a jukebox. These include serious offenses like sharing information with law enforcement officials, holding back money that you were supposed to kick up, sleeping with someone's wife, being so violent or erratic that fellow mobsters decide they can do without you, relatively minor mistakes like making a crack about how someone of lower status used to shine shoes for a living, or even just being in the way of an advancing co-worker who is more ruthless and ambitious than you are. The criteria used for including the ten hits discussed are how well the murder plan went off, if the conspirators and actual executioners got away clean, if the strategy made sense, and how well the short term and long term results of the murder dovetailed with organizational goals. It's no good getting rid of a greedy boss if he's replaced with someone just as grasping. Similarly, killing someone who may be under indictment could have the unintended consequence of enraging prosecutors and bringing even more heat to the organization. As the fictional Sollozzo said in The Godfather film, "Blood is a big expense". The book doesn't just discuss the actual murder plans or participants. In more cases than you might think, the men who gave the order or carried it out are still unknown to history. 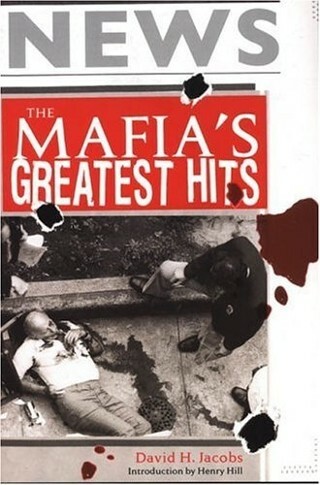 The book also explains who the murder victims were, their history, business relations and standing in the mob, why people may have wanted them dead, and what the aftermath of each murder meant to that particular mob organization, or in many of these cases, what the effects were on the mob as a whole. For example, the murder of Paul Castellano,as ordered by John Gotti put Gotti at the top of the Gambino Crime Family. But Gotti's rule proved disastrous for the Family and the NY Mafia as a whole and for him, personally. In some cases the book discusses if there is anything differently the men listed could have done to avoid being put on someone's termination list. Hits discussed include Big Jim Colosimo, The St. Valentine's Day Massacre, Joe Masseria and Salvatore Maranzano (both masterminded by Lucky Luciano), Dutch Schultz, Abe Reles, Bugsy Siegel, Albert Anastasia, Sam Giancana, Carmine Galante (that's him on the book cover) and Paul Castellano. This story is therefore a pretty fair oversight of top level 20th century organized crime. It's a good pick up for any crime history buff or a novice who has interest. It's quick reading. 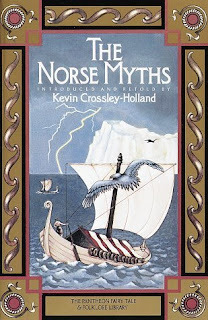 As a child I enjoyed reading about many different mythologies. But some I liked better than others. The Roman myths seemed to just be dimmed down retelling of Greek or Sumerian myths. The Greek myths were occasionally sexually disturbing while the Greek gods didn't seem to struggle against anything. IIRC there's a point in the Illiad where Zeus boasts to the other gods that they could all stand on earth and pull on one end of a rope but he could stand in Olympus and pull on the other end and pull them up to heaven. Greek mythology seemed to be one big pan-sexual party. I only got exposed to a little of African mythology growing up. Arabian mythology and stories were exciting but also full of some very ugly racism. 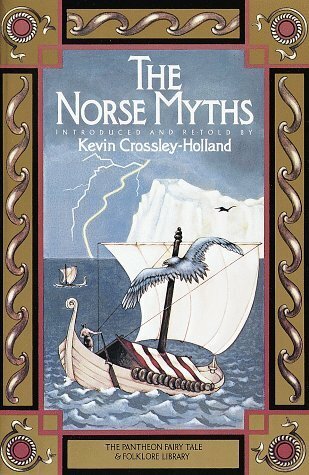 But Norse mythology was my favorite. Winter is coming indeed. The Norse Gods didn't always win. In fact at the world's final battle, or Ragnarok, they knew that they were doomed to lose everything. However they persevered anyway. And they certainly expected humans to do the same. It's grim. These are the gods the Vikings worshipped. It's these sorts of myths that inspired the 8th and 9th century Christian prayers "Oh lord deliver us from the fury of the Northmen!". It says something about the Norse culture that their idea of heaven was a place where you got to fight to the death all day every day before being reborn and feasting. Norse myths fit very well with my enjoyment of blues music. They were both similar in being realistic and even cynical about human motivations and needs while taking a slightly pessimistic view of life and a "me against the world" attitude. They also shared a strong sense of fatalism. "Fearlessness is better than a faint heart for any man who puts his nose out of doors. The length of my life and the day of my death were fated long ago"
This book is a translation and slight retelling of 32 of the most important Norse myths from the creation of the world, the beginnings of life, the start of evil, the final destruction of the universe and its rebirth. There are some intriguing links to other religious myths both near and far. Indian myths have world trees and the destruction of the universe by fire. Loki, a trickster archetype, is found in many Indo-European myths. But Loki is also (at least initially) reminiscent of the West African trickster god Legba while the blustering Norse thunder god Thor shares some characteristics and domains with the Yoruba god Chango. Even Odin, who sacrifices himself to himself, is pierced with a spear and hangs dead from the world tree for nine nights before resurrecting himself, has some obvious parallels to Christ. Humans are more alike than different and every human personality type or heroic figure seems to be represented in every religion or myth if you look for them. "The Marriage of Njord and Skadi" in which a god and goddess(giantess) decide that they cannot live together may be an early endorsement of feminist thought. 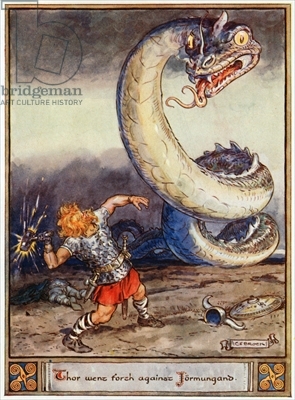 These are the founding myths which not only still resonate in some of our day names (Tuesday = Tyr's Day, Thursday = Thor's Day, Friday = Frigg's Day, Wednesday = Woden's Day) but also served as the basis and inspiration for such works as the Nibelungenlied and Wagner's Ring Cycle, creations by literary giants such as Tolkien, Michael Moorcock, and Poul Anderson, and a fair amount of Led Zeppelin lyrics. The stories have a fair amount of humor and wordplay which is apparent when Loki having lost a bet to a dwarf and forfeited his head tells the dwarf that although having lost his head, he said nothing about his neck. The powers of the gods, though far greater than those of men and most giants are not without limit. As guests of giants Thor, Loki and a companion are challenged to contests to show off the supposed abilities of the gods. Loki loses an eating competition. Their speedy human companion loses a race against a young giant. Finally Thor, disappointed in his friends' performance, steps up to prove his strength. The giants claim to not want to test Thor too much as they are skeptical of his abilities, given the poor results so far. They give Thor a horn of mead to drink from and tell him that even a weak giant can finish it in 2 swigs. Thor drinks and drinks but can make only a slight difference in the horn's level. The giants then ask Thor to pick up a cat from the floor. He tries and tries but the best he can do is to get one paw off the ground. Sadly the giants say they've seen enough and tell Thor they would ask him to wrestle against one of their champions but to do so would be an insult. So they place him in a wrestling match against an old crone. Thor is angered and calls upon all his might as strongest of the gods. But the old woman is unmoved. They wrestle interminably but finally the woman forces Thor down on one knee though she can't beat him. The giant king calls an end to the games and feasts begin. The next morning the giant king abruptly awakens Thor, Loki and their human friend and explains that all of them are far too dangerous to remain among the giants. The human raced against thought so there was no way he could win. Loki was trying to out eat fire so that was impossible. The horn of mead Thor drank from was actually connected to the sea. The cat that Thor tried to pick up from the floor was really Jormungandr, the serpent that encircles the world and which is fated to kill and be killed by Thor at Ragnarok. And the old woman who just barely forced Thor down to one knee was old age, which eventually beats everything. Though they pretended contempt the giants were actually greatly shocked by and extremely fearful of Thor's strength. Ultimately there are natural forces which neither man nor god can surpass. This is one of my favorite stories and is typical of the entire mythos. We're all going to die someday and there is nothing you can do about it. So you might as well go down swinging with a smile on your face and a song on your lips. Humans can get immortality via their deeds, which will live on long after their deaths.